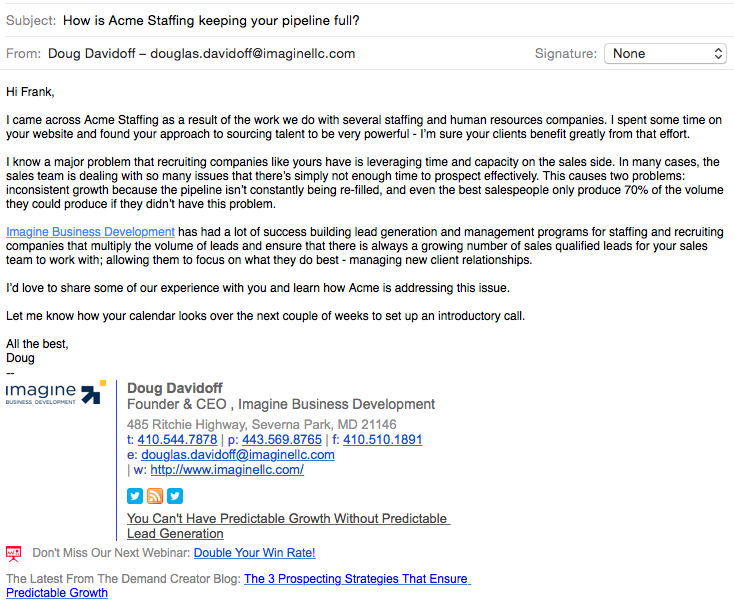 On Monday, I shared five rules for creating effective B2B sales prospecting emails. Today I’m sharing the four types of emails we utilize in prospecting efforts for ourselves and for our clients. Before I get to the emails, let’s be sure we are clear on the purpose of prospecting emails. They should not be designed to influence your prospect to buy from you. Instead they must be designed to influence the prospect to talk with you. There’s a big difference in the tone, message and approach when the focus is on “why we should talk,” instead of “why you should buy.” The most damaging (and common) mistake made in prospecting occurs when salespeople start selling too early. An effective prospecting effort should involve multiple tactics. When a lead enters your funnel, through inbound efforts or as part of your outbound program, you’ll want to utilize multiple touches in your outreach effort. When you’re trying to get a sales-oriented conversation started, you’re really selling two things: the value the company brings and the value the salesperson or sales development rep brings to the conversation. If a prospect isn’t familiar with the company, the likelihood of getting the conversation you want drops precipitously. On the inbound side, remember that just because someone downloaded a white paper doesn’t mean they’re familiar with the company. The Nurture Email is the primary tool to use to focus on the organizational value and to familiarize the prospect with the company. That said, the email is absolutely not an all about me blast. Rather, it’s the opportunity to share your teaching point-of-view, challenge your prospect’s thinking and demonstrate your empathy and understanding of their world. The Nurture Email should be a part of an ongoing nurture campaign personalized to the persona and what you know about your prospect. This email can be a little tricky, because it is often overlooked. The Follow Up Email is the one that goes out when you’ve received no response to your previous emails. Far too often, these emails are valueless and spammy. I’d like to say that the above email is an unusually bad example of a Follow Up Email, but unfortunately it’s a common bad example. Why would I respond to this email? 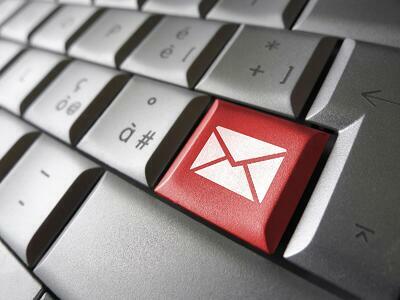 The Follow Up Email should be given the same attention your initial emails are given. The value of the follow up is the opportunity to build repetition into your message. When designing this email you should first look and see if the recipient has done anything with your previous email. Did they open it? Did they click on anything? What do their online actions tell you is resonating? When we design outreach campaigns, we typically develop 7 – 10 different follow up emails. They’re designed to be used in a sequence, with the ability to quickly customize them based upon what we know and what they’ve done. Each email continues to communicate a teaching point-of-view, and as I shared in Monday’s post, provides multiple ways for the recipient to advance the process. If you do nothing else as a result of reading this post, please – PLEASE – stop sending crappy follow up emails. Why are you the person and company they should talk to? Why should they talk to you now? While the structure of this email is similar across the board, these emails should be personalized to each person you send them to. For this reason, we don’t use The WYWYN Email in every outreach. We use it for our Account Based Marketing (ABM) campaigns and for highly qualified leads that have not responded. For The WYWYN Email to be successful you must identify a resonating issue that relates to the organization and person you are emailing, clearly communicate why you’re the people to talk with, and why they shouldn’t wait. The issue can be something you know specifically about them (this is the best approach) or it can be based upon what you know about organizations like theirs (you’re teaching point-of-view). The Business Case Email is a highly personalized email that is used later in the prospecting process. This email is used when your prospecting efforts began with a person below the level of authority you are seeking. This is a common occurrence when working with inbound leads where lower level people are often the ones that initially download content. However, it also occurs in outbound when your inquiries are delegated down or when you find less resistance at lowering levels to begin your conversations. Specific problems/issues the prospect is dealing with. What the prospect and their organization are doing to address those issues. How important those issues are viewed within the organization. Who is involved in managing the issues and who is involved in changing what the organization is doing. The discovery work you’ve done to date. The issues you’ve uncovered and the impact of those issues. How you can potentially address these issues. Why a conversation is beneficial, even if the prospect doesn’t buy anything from you. As you master these emails, you’ll discover variations that will work very well within your process. The key is to ensure that every email passes the Acid-Test: “If I were receiving this email, would I find it worthwhile to review and would I want to take action?” If the answer is no, rewrite the email. One final point: no matter how good your emails are, you still need to integrate other tactics to get the results you desire. Don’t expect your prospect to get your email and then jump to the phone to call you. The real value of these emails is to create leverage and make your direct outreach (yes, on the phone!) more effective.